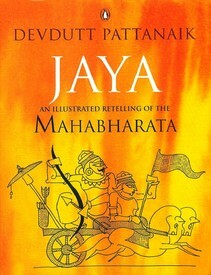 Jaya : An Illustrated Retelling of the Mahabharata, is a beautiful condensed story of our great and one of the longest epic written in very simple and easy writing style by Mr. Devdutt Pattanaik, Chief Belief Officer of Future Group. Devdutt had managed to hook the reader throughout the novel by his art of storytelling. It is my first read of the Devdutt and I am looking forward to read more novels. I have already buy Myth = Mythya. I came to know about him in our Management class of Organization behavior by our faculty. I would say it a must read if you have never been introduced to Mahabharata. It is good for the starters who sometimes shy away from the book considering it very long. Even if you have watched the serial on Television, it would be a good read. The best part about it is that it includes a lot of small regional stories which are not included in the other similar novels or TV serial. And also, the scope for the confusion is minimized by mentioning the different beliefs systems or different stories in the different parts by mentioning it explicitly. Also, it entails a lot of information through bullet points which are at the end of every chapter. In my case, as soon as the confusion arose, I referred the bullet points and it was solved. I have also read the Great Indian Novel by Shashi Tharoor which is about comparing the epic with Modern India. Different characters like Gandhi, Nehru, Bose are compared with different characters of Mahabharata. The part of Mahabharata in which Krishna gave the Geeta was bit short in the novel but that is okay as that was complete book in itself. One of the best dialogues I like is Krishna is wisdom and Arjuna is action and both of them are present inside us. I am also planning to read the book on Mahabharata by Gurcharan das, the difficulty of being good. To conclude, I would say you can read this if you are a starter or less than 30 as the novel is full of cartoons and pictures which are to impress the youth or attract the children but if you have really read Mahabharata 2,3 times by different authors, then I doubt if you will be moved. Thanks Mirza Ghalib for your precious time.